Let’s now turn our attention to the design of data. Using strings like "red", "green", and "yellow"; or "stop", "go", and "slow down". Using numbers like 1, 2, and 3. Combining types like true, false, and undefined. Regardless, we are translating information into data that represents that information. So if var trafficLight = "red", we interpret the data to mean a traffic light signaling to stop. Data definitions also help us distinguish between similar data. For example, the string "red" may indicate a background color elsewhere in our program. Data should be atomic, meaning it should be reduced to its essence without losing meaning. For instance, we could define a city as a string or we could define a city as a list of characters. Although, technically a city is made up of a list of characters, those characters have to be meaningfully formed together to be used in our domain. Similarly, atomic data is specific. Even though a traffic light could be represented by any number of strings, it is specifically the strings "green", "red", and "yellow". Data definitions should be orthogonal to the way we define functions. 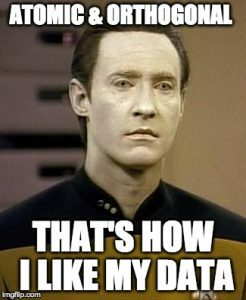 In other words, data should be mostly independent from the functions that operate on that data. This helps with refactoring our application later on as it can reduce the amount of places that need to change when functionality changes. We are going to design three different types of data, taking each through the systematic design process. They are data that represents: a traffic light, a natural number, and a coordinate. A type comment gives a descriptive name to the new type of data as well as how to form that data. JSDoc provides a way to define our data types using @typedef comments. Let’s look at how we might define a TrafficLight. Here we are defining a new type called TrafficLight that can either be the string "green", "red", or "yellow". In other words, any string that is one of the three defined above is a valid instance of a TrafficLight. Note: Although these are just comments and don’t enforce any runtime checks, they communicate the purpose and structure of our data enriching the meaning of any functions that make use of them. Note: you could use a constructor function as well for compound data. The important piece is that all the properties of the compound data type are documented. Next, we provide an interpretation for our new data type. The interpretation bridges the gap between our data type and the information it represents. Now our interpretation states that a Natural for our application includes any positive integer. Take a moment to come up with a clear and concise interpretation of the coordinate example above before continuing on. Examples provide more explanation of a data definition, if it would be helpful. Depending on whether type is self-defining. For an enumeration like TrafficLight, all the possible examples are already encapsulated in the type comment so examples are not necessary. In the same way, a simple atomic type like Natural documents its cases. The last step is defining a one argument function that operates on that data type. A template function provides a roadmap for any functions created later on that need to operate on this type of data. You may be wondering, why even write a template this simple. In practice, you probably won’t. Templates are intended to be copied when writing functions that operate on the given data. By writing a template you can easily see all the scenarios you need to account for in your function. You can cut out anything you determine is not needed. * Produce true if traffic light stopped. Write a data definition following the steps above representing the state of a door. The door can either be opened or shut. Write a data definition representing the state of a light bulb. If it is on, its brightness can range from 1 to 10 (10 being the brightest). It also can be off. Include any special cases in your interpretation. Write a function called increaseBrightness, following the designing functions process, that operates on the light bulb data type created prior. If the light bulb is off, it should be set to a brightness of 1. Otherwise, it should increase the brightness by 1 until it reaches 10. Once it reaches 10, increaseBrightness will no longer have any effect.